We at Aanifeira wish all our friends around the world a very Happy Easter. 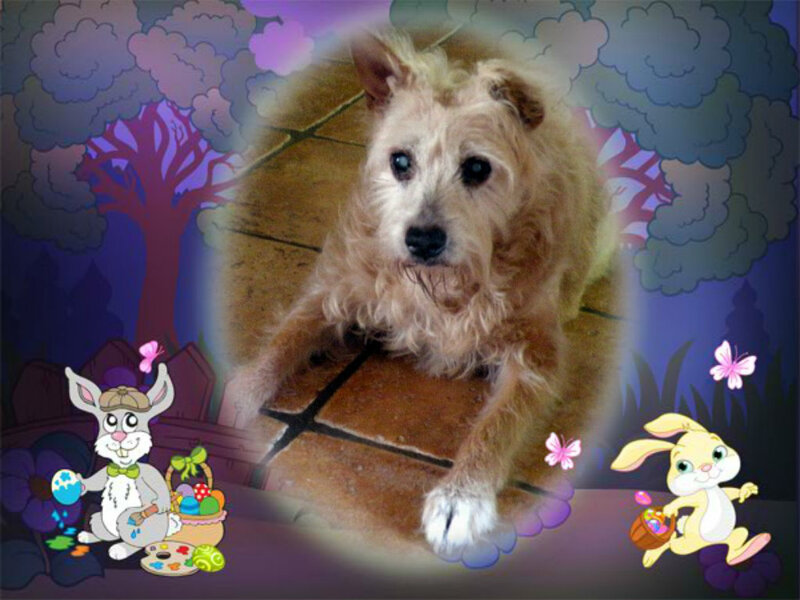 Pictured below is our very elderly and blind Podenga dog Sonia now living in France getting right in the Easter spirit. This amazing dog after so many years of living in a shelter finally found her forever home in 2012 with a wonderful carer. Our thanks to carer for sharing this image. More on Sonia’s story can be read here. This entry was posted in Animal Shelter, Podengo and tagged Abandoned Dogs, Animal Rescue, Animal Shelter, Disabled dogs, Podengos, Portuguese Dog Breeds, Shelters and Rescues, Unwanted Animals, Veterinarians, Volunteering in Animal Welfare. Bookmark the permalink. Lovely story, so pleased for the little dog.